After Labor Day, summer just slips away. Kids are in school, store windows are filled with sweaters, and the annual flood of Christmas catalogs begins. I usually start thinking about soups and stews and roasted root vegetables right about now. But summer is far from gone in the Northwest. The mercury is hovering in the 80’s and the corn is at its peak. With all the best summer produce just now flooding the farmers markets, the soups and stews can wait. Salads are what I want to eat right now. This Southwest-inspired salad is a natural for this time of year and you’ve probably eaten some variation of it over the years. Corn and beans are culinary soul mates after all. Throw in some crunchy red bell pepper, red onions and a medley of cherry tomatoes and who could resist? What set this dish apart, though, is the sprightly lime vinaigrette that brings all the flavors together. Lime zest, along with a little cumin and chile powder, contribute extra zip. Then crumbly Cotija cheese adds a salty kick. (Feta or dry Monterey Jack are good substitutes if you can’t find Cotija.). We brought this salad to a neighborhood block party last weekend and it was an instant hit. I’m such a fan, we’re likely to eat it several more times before the summer harvest draws to a close. 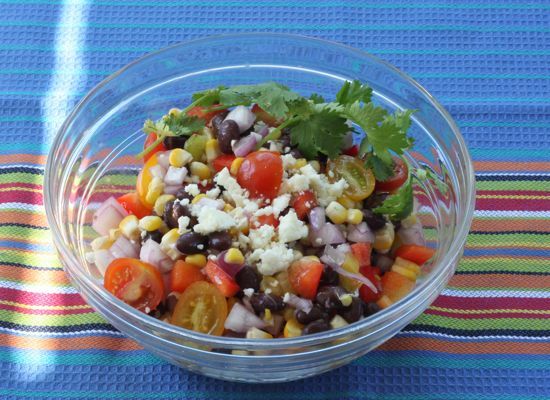 In a medium bowl, combine corn, beans, red bell pepper, onion and tomatoes. In a small bowl or glass measuring cup, whisk together lime zest, juice, oil, cumin, chile powder, garlic and salt and pepper to taste. Drizzle the lime vinaigrette over the salad, stir, and let set, covered, at room temperature for about 30 minutes before serving. At the last minute, stir in the cilantro and sprinkle cheese over top. Serve.